Not only a forecast a whole 10 days out, but a total over the full 10 days. Presumably safe to ignore, unfortunately. Do you have a 5-day version of that instead? If a 5-day version showed something similar, it would be very interesting, especially over the CAB. The image from bbr2314 shows, I believe, total accumulated snowfall forecast over the next 10 days. How much will have melted along the way is another story. Some of the time Newfoundland will be cold and snowy - and some of the time Newfoundland will be warm and the snow will melt. It is that time of year. On May 17, 2018, none of SMHI's observation stations had a measurable snow depth. It is therefore no longer meaningful to update the snow depth map for the 2017-2018 season. However, note that there is still snow in higher mountain ranges, but SMHI does not measure snow depth there. Also adding temperature anomalies for May 1-28. June snows in New England are extraordinarily rare, the best known case is 1816. Coincidental to talk of developing Nino, snow showers did occur 6/1/2009. So why have they not updated the SWE and extent graphs since May 28? Annoying or what. WOOF! 2X normal *without* mountain SWE! CCIN is annoying but it is obvious looking at satellite we are still way above normal. I think this verifies the notion that extreme spring SWE can result in a lag to the melt season (and/or its lengthening). This results in increasingly negative temperature anomalies as you head deeper into spring (and then summer), as the proportion vs normal becomes vastly more impactful when normal hits or approaches 0 and a sizable extant volume remains. I think this also results in extremely insane weather patterns as the extant albedo combines with the abysmal sea ice conditions (i.e. relatively poor-er albedo vs. norm) to generate a "flipped" 500MB pattern where blocking / continental warmth increasingly dumps into the Arctic. I think the most surprising development this year after the gains themselves were 1) the extremely steep and rapid April NA SWE loss and 2) the extreme and prolonged plateau thereafter, which seemingly continues to-date. Given the combination of the two factors ^, I think we are vastly under-estimating the impact of increased NHEM snowfall and its potential to mitigate absolute global warming (but aggravate net effect / damage of climate change). It is now seemingly plausible that a 1,000KM^3 melt event can help maintain limited but severe continental cooling in the weeks thereafter, constrained to the geography of the snowcover that remains as peak solar transitions toward the High Arctic. The question is, if we have another 500KM^3 extra SWE at peak-April in another five years, does the proportion of that extra SWE that is going to melt by June *decrease* as the overall surplus increases? As we move forward into the 2020s, if ^ is accurate, I except April and May to become increasingly wintry across parts of Eurasia/Europe and North America. June is also likely to follow for the populated belt of 40-50N by the end of the decade, if the trends re: sea ice and SWE are continued. If we repeat 2003-2018, 2033 will have about 2,000-2,500KM^3 extra accumulated continental SWE by mid April, and North America specifically will be about double its current #s, at 3,200KM^3 vs. 1,600KM^3 seen this year. If *doubling* early 2000s normals in Mid-April (2018) is sufficient to result in our current situation by June, quadrupling them is going to result in anomalies persisting into at least July and possibly August. Summer snow may soon become a normal event in cities like Montreal. As usual, I wish to counter these statements. Statistics of snow depth don't show that thick winter snow lasts much longer than thinner snow. Melt-out date mostly depends on weather suitable for melting, and on additional spring snows. I believe this statistical evidence shows that snow does not create its own weather, even if this year happens to combine thick winter snow with delayed melt-out. Moreover, albedo is set by snow extent, not depth, and extent this year is not extreme, running at slightly above +1SD. Not a weather-shattering figure. That is incorrect. Albedo is highly affected by depth. Compare satellite of this year versus all since 2000. 2009 is the only year that comes close to the brightness of 2018. Depth is especially significant over Tundra. The difference between 5" and 10" of snow is coverage of all vegetation and complete whitness / near perfect albedo (e.g., just look at satellite data this year). Depth is critical to albedo -- the deeper the snowpack, the brighter it typically appears on satellite. Albedo is highly affected by depth. Freshly fallen snow has the highest albedo. Slight surface melt of deep snow can lower albedo dramatically due to changes in snow crystals. That does not dispute ^. Yes, deep snow can get blue-er. But 10" of snow has a higher albedo impact vs. 2" of snow. So, it appears albedo is affected by depth for snow when the depth is less that 20 or 30 cm (8-12"), according to this paper. Indeed! If this is accurate it is extremely alarming as the yawning + SWE gap means a vastly higher % of area is going to pass the threshold where albedo impacts are much greater, for a much longer % of the year. I wonder how close we are to a runaway effect, given the lag in SWE loss this May. 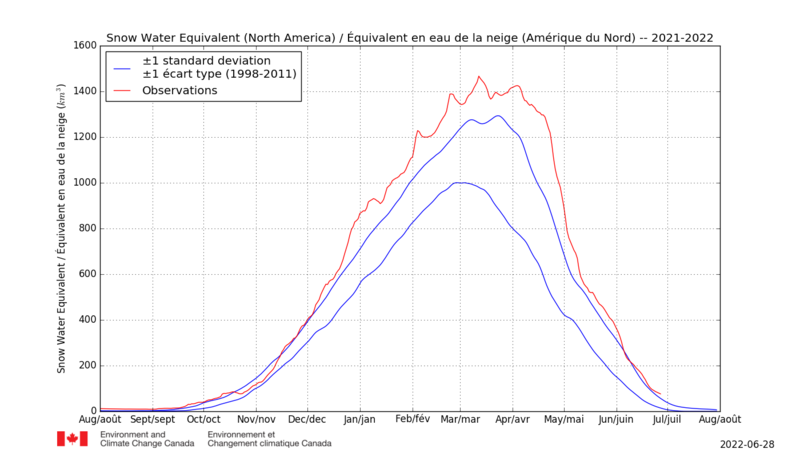 It may only take a doubling relative to current values for albedo/etc to allow snowcover to begin piling up year-round in places like Quebec, and current forecasts showing snow falling as we are almost at solstice would support the notion that, if SWE was even doubled, many regions could make it through solstice at which point they would only have to survive the relative heat surge from the declining high sun in late July, before "autumn" kicks in by August. I would also expect the curves for Tundra relative to a mountain valley in France are more gradual / have higher end-results. EOSDIS shows Nunavut and Northern Quebec on par with Greenland, or even brighter. Tonight's 00z EURO is quite impressive, reverting again to sustained cold across Quebec through D10. Wow! Seven days from solstice... incredible! How is this proof of a feedback mechanism, rather than merely a late spring in some of the locations? In order for there to be a SWE-albedo feedback mechanism, there needs to be a statistical predictive power - areas with high anomalous snow at a certain date (say April) should show a tendency for anomalously cold weather at a certain later date (May). This predictive power should be verifiable over different years. Merely showing that spring arrived late in some locations in May coinciding with late snow cover in the same locations in May means nothing. A late spring will lead to a late snow cover. In addition, there should be some relation between the specific locations of high SWE in April, and the temperatures in May. Not just that high NA SWE in general resulted in some locations having a late spring (while others had an early spring). 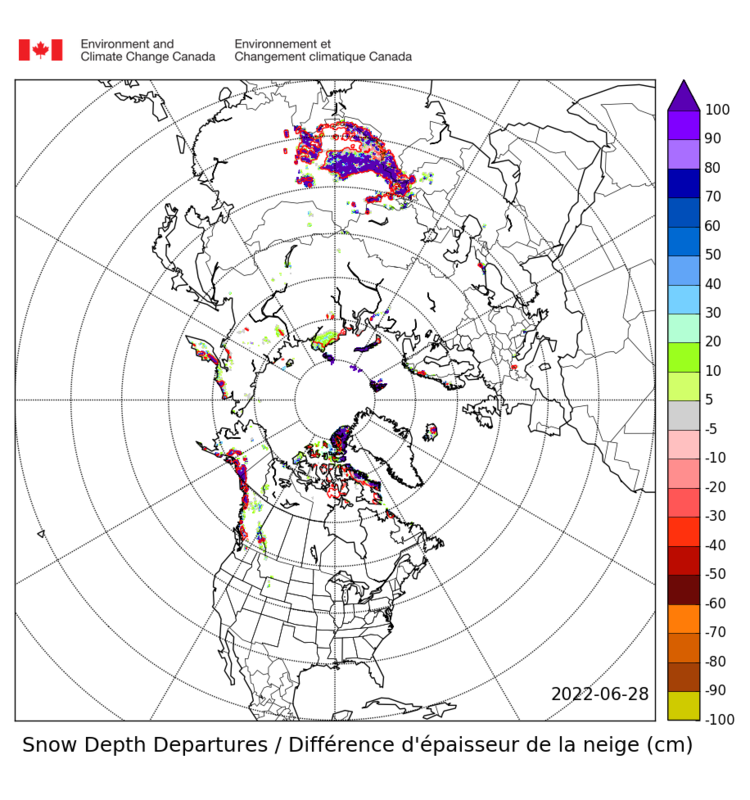 This year, anomalously high snow was prevalent south of Hudson Bay and across Quebec, while late spring happened mostly north of Hudson Bay, and in northern Quebec. Ontario had high April snow but positive anomaly temps in May. My tired old eyes can't see the proposed correlation this year (not to mention that we need similar data from other years in order for this to be serious proof). Spring was delayed everywhere it just varied depending on the latitude (including Ontario). If you can't see the correlation between the SWE map and the attached to this post I can't help you. I do agree we need more years of data for verification but to me this feels like a 2007 or 2012-esque state change that will soon begin accelerating too quickly for meaningful data to accumulate before impacts begin to extend much deeper into the spring and summer. I would even posit ^ is already happening as the +extent still remaining (and high albedoes) are acting against a horribly melted High Arctic to fire continental heat pulses directly toward the CAB from both Eurasia and North America. I would like to add a prediction as well. The maps ^ show that the entire High Arctic has been torching with the exception of HB, BB, and Kara. Each of these regions are likely (IMO) to retain substantial area well into August, and final melt-out will not occur entirely until 8/15-9/1. This is going to create a situation where the ridiculous 500MB anomalies already presenting continue to worsen as the residual extent/SWE situation in adjacent landmasses combine with the "protected" ice this season to prolong the springtime pattern well into summer. This also means that area/extent numbers in the High Arctic (focused on CAB) may well reach their lowest levels on record, as cold air is unable to resolve/remain in the Arctic Ocean and is instead focused in the vortexes SW of Greenland and over the Kara (and eventually there will be another in NE Siberia). Interesting prediction, especially as these regions are not anomalous at the moment - HB average, Baffin low, Kara high. All three regions tend to melt mostly in June and July, with a residue of 50k-100k for HB, 50k-150k for Baffin, and 50k-150+k for Kara on Aug 1st, eyeballing AMSR2 data from recent years. I assume you mean that area retained will be higher than these normal residues. If this comes to pass, and area on Aug 1st is 100k higher than the upper end of the ranges I mentioned, I will be extremely surprised. My own prediction is for normal area residues on Aug 1st. Also: uptick or error? We shall see. Now that Rutgers Snow lab published the Northern Hemisphere snow cover for May (see attached picture), I ran my regression formula on the 1992-2015 training period, using May data for snow cover, ice concentration and ice area, and arrived at a prediction for September sea ice extent minimum of 4.84 M km2. It's a negative anomaly for May. NH snow extent stood at 18.26 million km2 which is -0.76 million km2. This is the first negative anomaly since Dec 2017. Although as Rob's chart shows the negative departure is still a lot less than the May departures we have seen over the last 10 years (2017 excepting). Cover was below normal over central Siberia and much of western Canada, as the interiors of the continents heated up rapidly. Much of Quebec and western Siberia saw above normal snow cover. Chart below shows monthly departures over period 2016-2018. Have you changed your model to fit the new monthly extent calculations from NSIDC? Due to the change the average extent is 100-200k km2 lower than with the old version. I just finished my forecast and got 4.2 million km2. Thank you Tealight. I was not aware of this new definition of Sea Ice Extent. the basis for the numerical algorithm in V2, while the latter describes V3. I do think the V3 definition makes a lot more sense, and IIRC we had discussions here on the ASIF and the ASIB about the odd old (V2) definition last year and before. As far as predictions are concerned, I will enter all new V3 data, and re-do my calculations. Yet, since the difference is a maximum of 200 k km2, it does not explain the difference between your ("4.2") and my ("4.8") prediction. How are you accounting for land snow cover in your prediction ? It took some experimenting to find this value. I just got the best results with it in reanalysis. If you look at a map and wind systems like nullschool then you can see snow cover values in April don't matter for the Arctic. All the cold air in snowy eastern Canada just gets blown into the mid latitude Atlantic and never effects the sea ice. The same is true for south and eastern Eurasia. I re-ran my regressions with the new NSIDC V3 data, and indeed ended up a bit lower : 4.65 M km2 Sept extent. Standard deviation over the residuals is a bit higher (470 k km2) than with V2 data, but not substantially. You are using more variables than me, and use them in a different way (like your snowcover cut-off) so it is not surprising you get a (slightly) different result. Will you be submitting to SIPN again this year ? Well of course I use variables different then you otherwise it makes no sense to submit it as a different forecast. I already submitted mine and this time chose statistical instead mixed. With the new NSIDC V3 I don't have to guess anymore how much the ice moves in September which increases it's apparent size. I have sent an e-mail to Envionment Canada to ask why the snow-tracker graphs on https://www.ccin.ca/ccw/snow/current have not been updated since 28th May. If they do not answer I will have to write a letter to DJT and we will have to invade. Restore the snow graphs -- or else!!! I have mailed them multiple times a couple of months ago, using various mail addresses, and even tried to call them. But never received a reply. Which makes not updating the graphs even more annoying / perplexing. I would think this is further verification that we may be in very deep trouble. It is snowing atop Mauna Kea & Mauna Loa (... 10 days from solstice). The method is different (lava entering the ocean generating steam which is then rising and cooling the summits). But the way the Arctic behaves will be quite similar as oceanic SSTs continue rising while continental SSTs remain the same / are cooled by Greenland. The combination of continental resilience to heat accumulation via GHGs and oceanic vulnerability = more "steam" (aka clouds), and therefore more snow, as 2018 has proven. The above is, perhaps, a meaningless anecdote. Or not! High Commissioner for Canada to the United Kingdom of Great Britain and Northern Ireland." "Thank you for contacting Public Affairs at the Canadian High Commission in London. We will aim to answer your query as soon as possible." You never know - it might touch a nerve. Thankyou for bringing this to our attention. We are looking into this and will get back with an answer when we are certain of the issue. If 2018's anomalies can yield a map like this come post-solstice June weather, I would hate to see what these maps look like if we go 25-50%+ beyond the SWE accums of this winter. (actually the last 3 somewhat agree - mainly looking at Victoria Island, Baffin Island and northern Quebec & Labrador). None of the graphs had updated in 2-3 weeks, but now they're back! (except for FMI) - Snow water equivalent is back down to ~+1.5SD (another cliff in June). Extent now a bit more than that - ~+2.5SD. In an el Niño year the flood maps would be much more interesting. OK, so colder than normal, but GFS says well above freezing most of the time so snow cover extent and SWE will continue to decline. Hudson Sea ice loss is late compared with recent years, but still still ahead of the 1980's, 1990's and 30 year averages. That late snow melt had an effect, but not huge. Although the literature does seem to say that snowfall in high latitudes will increase, I am still looking for a reason to assume that the 2017-18 very high values are the new baseline for those increases, especially if there is less snow and more rain in lower latitudes. Graphs attached for 21 June. ps: I will never know if my letter to the Cnadian High Commission did the trick on getting https://www.ccin.ca/ccw/snow/current to restart updates. All the snow seems to be gone, except, of course, on the Tibetan Plateau. I know you are just being sassy but I see plenty of greens across Quebec / etc. 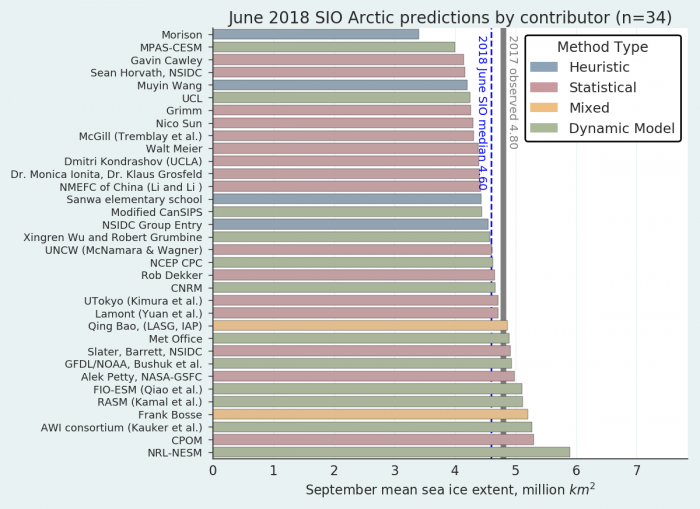 They are not huge areas at this point but the anomalies are nevertheless significant, especially with insolation currently at peak, which amplifies their contribution to the cryosphere. I still think the Tibetan Plateau anomalies are legitimate. They have grown into the spring, they weren't distributed like ^ all winter. I suspect precipitation is increasing even more in low vs. high latitudes due to proximity to oceanic heat content. For reference, it was snowing / freezing rain-ing on Mauna Loa and Mauna Kea this month. That is @ 13,000' in the middle of the Pacific, it is hardly inconceivable that altitudes of 10,000'+ in the Himalayas (much closer to cold air sources and generalized albedo that is more favorable to retaining cold) would or could be among the first signs of impending advances in SWE first, glaciers second. Yes, I'm being a bit sassy. But it's a feature that still intrigues me. You know what intrigues me? Quebec! We could be only 60-90 days or so from the start of winter for areas adjacent to whatever ice is most resilient in Foxe Basin and Baffin Bay. The shift from 2012 -> 2018 is due to our hitting an inflection point re: impact of oceanic heating some point around then. The situation re: continental albedo since then has quickly evolved into "absurd" territory concurrent with continued oceanic warming / decay of high altitude sea ice. It looks like 2018 is essentially a more "evolved" version of the 2012 pattern. The NATL vortex is now displaced over Greenland due to the tremendous fall in NATL ice / Greenland ice since 2012. This shift allows it access to much colder source air / also puts much more snow onto Greenland and could also help explain why we see the worsening blues over Quebec (Greenland is a source region) and NW Africa. At the same time, the increasingly potent cold plunges SW / SE from Greenland lift more heat up from Eurasia / etc (and GHGs amplify continental heating when snowfall is lacking, esp at night). Combined with the worsening albedo anomalies in the high mid-latitudes the effect is disastrous on the sea ice. In fact, the picture this June over much of the Arctic is far worse than what it saw in 2012. I think it is even more important that the sequence of melt in 2018 is going to allow for much more open water in high latitudes much earlier on than in 2012 (remember our extent etc is still buffered by Hudson and Kara). This will allow more insolation to accumulate and may create the worst September / October couplet for the sea ice on record. Median projection this year is 4.6 M km2. Incidentally, that is pretty close to my estimate of 4.65 M km2 which was based on the Northern Hemisphere albedo (snow cover, ice 'area' and 'extent') in the report. 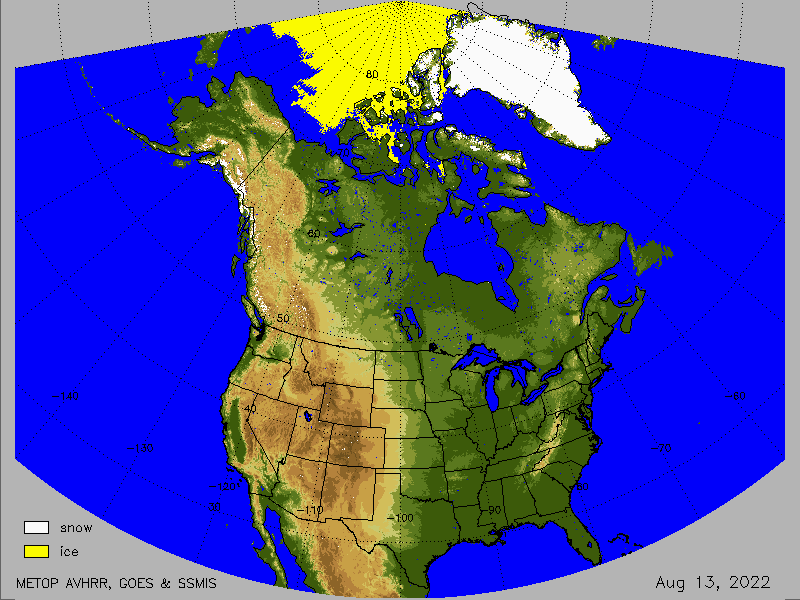 But also if you zoom out and look at the entirety of North America you can see a sharp reduction in snow cover. Is this real snow loss or an illusion caused by enhanced satellite imagery? Watch for several loops, notice how the snow snaps back when it returns to 1984.